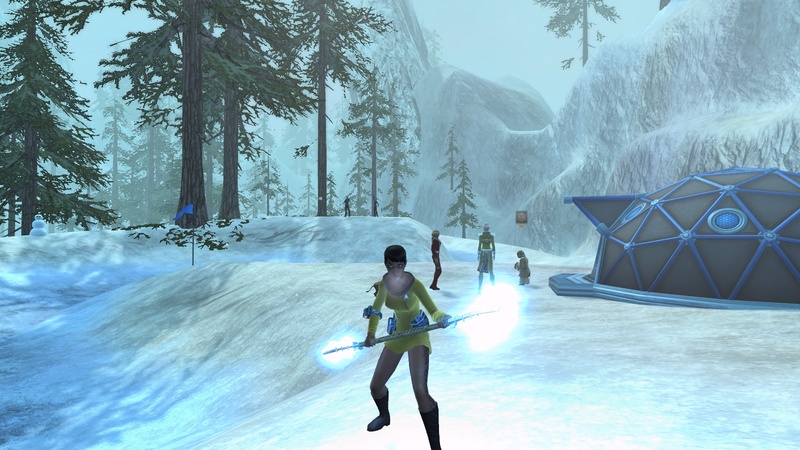 Last week, Mr. Randomessa’s excitement got the better of him and he, too, re-subscribed to Star Trek Online to join me in boldly getting ahead of the free-to-play launch. Of course, then Cryptic opened up access to anyone who had previously held a subscription as of January 5th. D’oh! It would just be our luck. Since then, my husband has gained a rank on his Klingon and he and I have quested together Fed-side, and even done a couple of the PvE scheduled events together Klingon-side. I have been going to bed earlier the past few nights, so my own gameplay has been spotty, but the wonderful thing is – no worries; I just match his rank when we group and all is well! He is also very enamored of the Duty Officer system and is taking it extremely seriously. Tipa has referred to Doff management as Facebook-style “cow clicking,” and I have never played a FB game so I can’t comment on how close that comes to the mark, but at any rate, it’s helped me set a new criteria for what I’m looking for in any future MMOs I play. In fact, one of my only existing concerns about Guild Wars 2 is that all of the minigames I’ve heard about so far involve competitive gameplay of some sort (bar brawl, keg rugby, shooting gallery) and what I really want is something with a non-combat focus and in which I do not need to compete against other players, but can still advance my character. I don’t need it to be all of the time. Just some of the time. More and more I’ve been thinking about the MMO features I prefer and how they affect my enjoyment of the games I play, such as how greatly world travel and level-gating has impacted my husband’s and my enjoyment in LOTRO. These are old issues, familiar enough to MMO players that we have our cute slogans and practices, our static groups and our spousal leveling contracts, but something about wanting to enjoy my time in Tolkein’s universe and feeling thwarted instead of welcome every time I tried to share my gameplay with someone outside of a PUG made me snap, and I have decided I just won’t put up with these kinds of things anymore, no matter how intriguing the subject matter or setting of an upcoming game. I think this is what made it so easy for me to pass on the launch of SW:TOR after one beta weekend, my other reservations notwithstanding. If I were to have a New Year’s Resolution this year (I haven’t made any), it would be: I will not participate in another spousal leveling contract. …across the universe, etc. etc. I actually did the unthinkable this holiday season: I re-subscribed to STO to bridge the month before it goes free to play. Me! Re-subscribed! I’m not sure that I’ll spend any more money on STO past this subscription, but I was so impressed by the changes to the game that I wanted to throw some cash Cryptic’s way, and this way I get to keep playing prior to January 17th. Which I have been. I have even given running missions Klingon-side a try, trying to see how much I can level between PvE missions and Duty Officer management (which are so much more amusing than the Fed-side DOff missions) and no PvP whatsoever. Despite the furor on the forums about the Star Wars-inspired glowing lirpas and bat’leths that Ferengi!Yoda was handing out until earlier this week, I was a bit disappointed that they didn’t look more like the lightsabers they were decried as. One of those “all this kerfuffle over this?” moments, to be sure, but I find that is often the case on the official STO forums, where if you aren’t angry about something, you’re a fanboy. 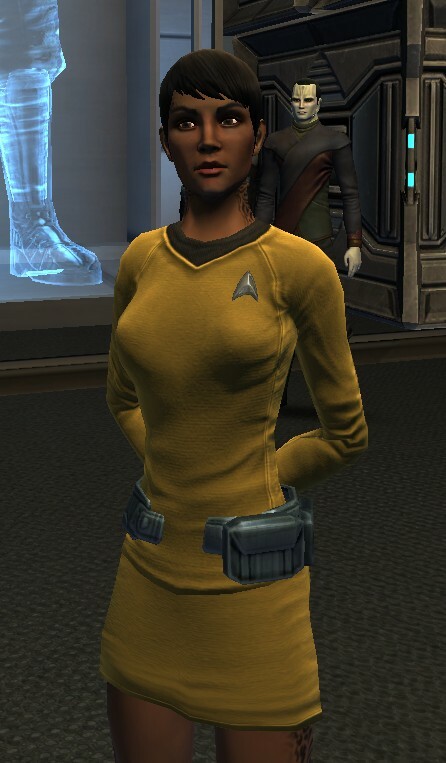 Aside from making Mr. Randomessa extremely jealous over being able to play the game while he waited until he couldn’t justify paying $15 for as many days of subscription, I have also dipped into the Foundry missions (a whole new level of fun) and have been catching up on STO podcasts. 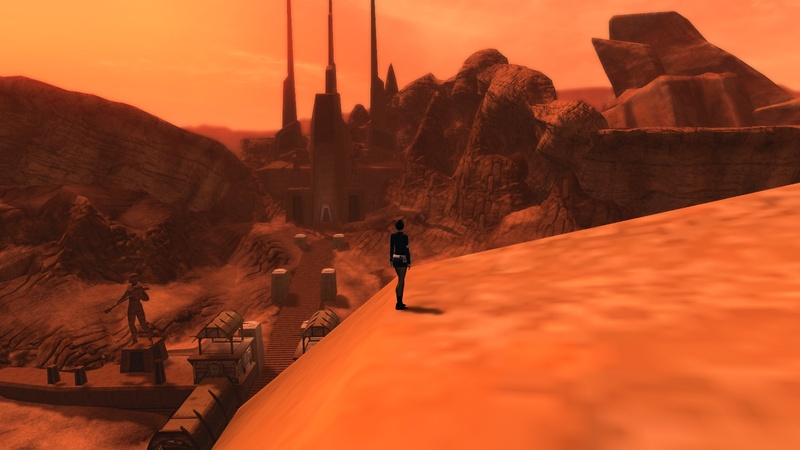 I have also found possibly the only Star Trek Online forum that isn’t full of bitter naysayers at the Trek BBS (my home on the internet when my husband and I were mainlining DS9 a couple of weeks ago). Oh, and I’m trying out the diplomacy missions for the first time and am still running races in Q’s Winter Wonderland, which, again, goes to show how much I appreciate non-combat and non-competitive options for gameplay. I tried popping in to Guild Wars’ Wintersday celebrations and popped out again rather quickly for that very reason. Tis the season not to fight anything, for me. I have to say that unlike most MMOs where I do like being in the thick of pre-orders and the surge of new players embarking on their first journeys together, STO was one of those games where you didn’t get a whole lot out of being an early adopter (unless you were a lifetime sub from the start) and coming in later means I have so many parallel paths of advancement that I don’t expect to run out of things to do for some time. Of course, this also means that all of my content stories will be old news to those who ranked up to Admiral last year. Oh well; time to delve deep into the Foundry, I suppose. And then I jumped off. For the past 10 days I’ve been taking part in the Star Trek Online free key and item bundle offered here by Alienware. I already have my veteran account, of course, but I wanted to give the game a free once-over before it actually goes free-to-play, and this past week, with all the excitement of everyone else in the free world playing SW:TOR, seemed as good a time as any. Mr. Randomessa and I stopped playing STO only a few months into our year-long subscriptions, citing several conflicts of interest, from my aversion to what I felt was excessive space gameplay, to his PvP burnout Klingon-side, to our disappointment with the crafting system, among other quality-of-life issues. We left just as the Episodic content was starting to get underway, but by that time our enthusiasm was spent and we didn’t delve too deeply into the weekly episodes. We didn’t write off the game completely, however, opting instead to wait and see how the next year would change or improve things. Having ranked up to Lt. Commander on a new character, I think the wait has been well worth it. The most praise I have to offer is for the Duty Officer system, which adds a compelling means of non-combat advancement – something I’ve been wanting in MMOs for as long as I’ve been playing them (are you listening, ArenaNet?). Since usually this comes in the form of crafting in other MMOs, and crafting is generally on a separate XP bar than adventuring, the Doff system, for the first time in any MMO I’ve played so far, allows me to rank up even if I’m not actively completing missions or engaging in patrols. I cannot express how tickled this makes me; over the past week I leveled twice just from having completed Doff assignments. This also partially resolves the problems caused by having a singular leveling path for all Fed and KDF characters (which I have previously criticized), in combination with the ability to “skip” missions (which I should also mention is an awesome feature!). Combined with Squad Support putting an end to our need for our spousal leveling contract means that Mr. Randomessa’s and my leveling options were just blown wide open. Second is the extra love being added here and there, from the occasional voiceover (Bioware has nothing to fear on that front, to be certain), to inserted cutscenes, to chairs you can sit on without using an emote (a feature I haven’t seen in any MMO I’ve played other than WoW). I’ve participated in Q’s Winter Wonderland, had a snowball thrown at me, fawned over other characters’ fashion choices (I’ve never been the type to ask “where did you get that outfit?” let alone spent much time trying to emulate them, but the new additions to wardrobe have unveiled this tendency in me and allowed me to indulge my love of the fantasy genre even within this universe), and remembered how cool it is that I can make a Cardassian given the character creation tools Cryptic has provided me. I even got a “boo, hiss” tell from another player for running a Cardie, which was surprisingly satisfying. For the Republic! Er, wait, what game is this again? I must also give bonus points to Cryptic for adding the ability to purchase Cryptic Points in-game through the exchange of refined dilithium. I feel this is Perfect World’s hand at work, since PWI’s other games also tend to feature the ability to exchange (exorbitant amounts of) in-game gold for cash-shop items. That the option is there is always a plus in my mind, just as I appreciate the means of acquiring Turbine Points through gameplay in LOTRO. 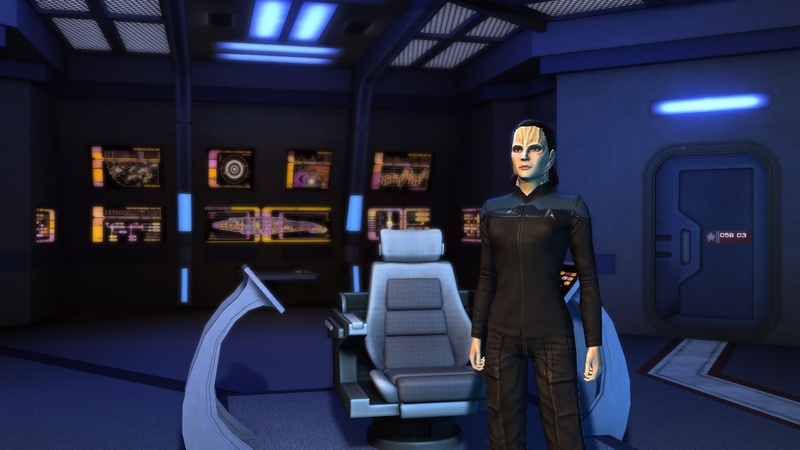 In short, STO has added or improved on a lot of features that Mr. Randomessa and I dreamed of from the start, and we’re more than ready to jump back in on the F2P launch date. We also can’t wait to check out the entries on the Foundry, which from the reviews I’ve read make even greater use of the engine than Cryptic does at times. There are only a couple more items remaining on our wishlists, including being able to see our Doffs on our ship when we explore the interior, and the ability to have quests and/or combat take place in ship interiors. It remains to be seen how long I will be excited about STO before my love of fantasy settings begin to chafe again – costuming aside – but I still have my active LOTRO gaming sessions to scratch that particular itch. My free 10 days in STO ended yesterday, and I was loathe to log out that last time, hoping instead to see how just one more of my Doff assignments would end… and then another… and then another…. You know how it is, new shiny MMO experience and all.